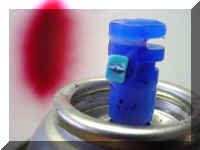 Recommended spray paint: "Hobby Enamel" It comes in short spray cans like Testors Spray Enamel®, Plasti-Kote Odds n' Ends®, or Krylon Short Cuts®. Most act "runny" so follow the instructions below. In a hobby shop, lacquer is also sold in short cans. Do not buy lacquer. It will melt thin styrene plastic. 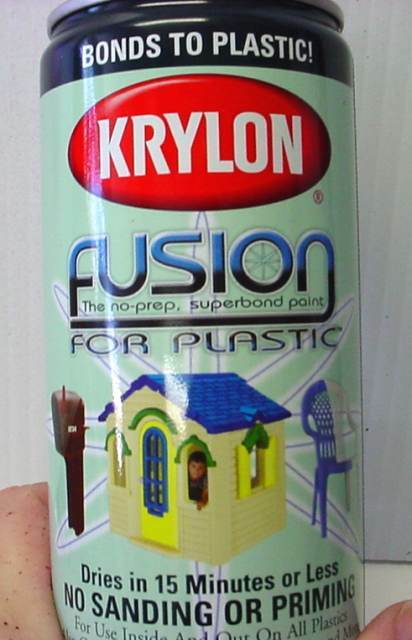 Krylon makes "Fusion" spray paint. It advertises "The no-prep, superbond paint for plastic." I have seen it at Wal-Mart, Ace Hardware, and Hobby Lobby. It bonds as well as their "Short Cuts" hobby enamel. It comes in a 12 ounce "tall" can with a Fan Nozzle. Colors are limited. It flashes (dries) faster but appears to be the same as their hobby enamel. Satin-finish colors are available for some of their colors. 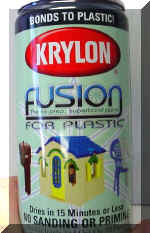 A great clear coat for Fusion paints is their "Mystic Prism" clear. It contains very tiny prism flakes that sparkle in the sunlight. You will need 3 coats for a good wet gloss look. Stocked at Hobby Lobby stores. May not be on the same shelf as the rest of the Fusion colors. Look near the other clear coats or texture sprays. Avoid older cans. Test spray on a white piece of plastic. If it is dull, yellowish, and opaque, return the can for a replacement. It should be clear and glossy. A slight whitish fogging is normal when it is sprayed on too thick. This is not "blushing". It will clear up as it dries. RUST-OLEUM's Painters Touch 2X Ultra Cover Paint + Primer and their American Accents 2X Ultra Cover are also very good and bond to the plastic without sanding. They have more pigment than Krylon's Fusion, but they don't have a fan nozzle. Start with a light fog coat, don't go for gloss at the first coat. Then after flashing, add a medium coat. 2 coats will cover in most colors. They also have clear coats that can be used to improve the gloss. Runs will result from the nozzle being too close to the work. Stay back about 10 inches or more. Avoid windy days. Dark colors can blush like Krylon Fusion paints if painted on very humid days. Their satin finishes and primers can resemble below the waterline anti-fouling paints. Plasticote has tall cans of "Plastic Safe" paint as well. Read the labels. 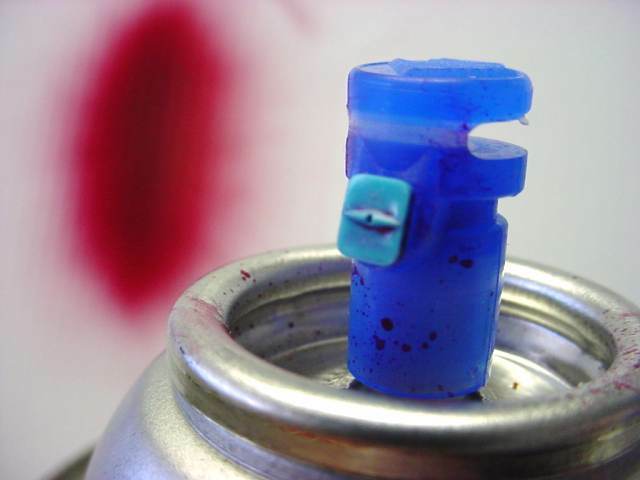 Avoid paints not recommended for Plastics or Styrene in particular. Test unknown paints on scraps of plastic. The thin scrap trimmed from around the stack is a good indicator of how the plastic will react to a particular paint. Click all framed photos to enlarge. Fan nozzle and pattern at 10" to surface. 2. Masking your Vac-U-Tug Jr.
3. Spray Painting the Vac-U-Tug Jr.